Bugatti is one of the most celebrated marques of automobile and the one of the most exclusive Italian/French/German car producers of all time. The company is legendary for producing some of the best sports cars in the world. The original Bugatti failed with the advent of World War II, but has been resurrected twice, most recently under the Volkswagen Group. Although founder Ettore Bugatti was born in Italy, the automobile company that bears his name was located in Molsheim, in the then-German Alsace region (which went back to France in 1919). The company was known for its advanced engineering in its premium road cars and its success in early Grand Prix motor racing, winning the first ever Monaco Grand Prix. The company's success culminated with driver Jean-Pierre Wimille winning the 24 hours of Le Mans twice (in 1937 with Robert Benoist and 1939 with Pierre Veyron). Bugatti's cars were as much works of art as they were mechanical creations, with hand-turned finishes on the engine blocks, lightening holes in every conceivable location, and safety wires threaded through almost every fastener in intricately laced patterns. He regarded his arch competitor, Bentley, as "the world's fastest trucks" for turning their attentions more towards durability. Bugatti's disdain for his customers is as legendary as his devotion to his creations; in one apocryphal incident, upon greeting an unhappy customer returning to the factory with "What, you again? ", he replied to the subsequent tale of automotive mechanical woe with "Well, see that it does not happen again!" and strode away. From the shapes of his engines, he is regarded a Cubist and he once went to a meeting of Cubists. On January 2, 2009, it was revealed that a rare 1937 Bugatti Type 57S Atalante had been found in the garage of a deceased surgeon in England. Only 17 of this model were made, by hand. Bugatti cars were extremely successful in racing, with many thousands of victories in just a few decades. The little Bugatti Type 10 swept the top four positions at its first race. 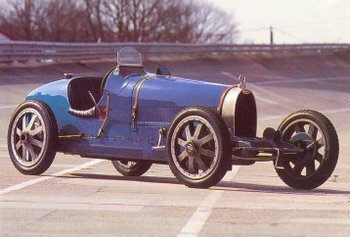 The 1924 Bugatti Type 35 is probably the most successful racing car of all time with over 2,000 wins. Bugattis swept to victory in the Targa Florio for five years straight from 1925 through 1929. Louis Chiron held the most podiums in Bugatti cars, and the 21st century Bugatti company remembered him with a concept car named in his honour. 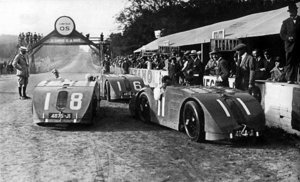 But it was the final racing success at Le Mans that is most remembered—Jean-Pierre Wimille and Pierre Veyron won the 1939 race with just one car and meagre resources. Ettore Bugatti also designed a successful motorized railcar, the Autorail, and an airplane, but it never flew. His son, Jean Bugatti, was killed on August 11, 1939 at the age of 30, while testing a Type 57 tank-bodied race car near the Molsheim factory. After that, the company's fortunes began to decline. World War II ruined the factory in Molsheim, and the company lost control of the property. During the war, Bugatti planned a new factory at Levallois in Paris and designed a series of new cars. Ettore Bugatti died on August 21, 1947. The company attempted a comeback under Roland Bugatti in the mid-1950s with the mid-engined Type 251 race car. Designed with help from famed Alfa Romeo, Ferrari, and Maserati designer Gioacchino Colombo, the car failed to perform up to expectations and the company's attempts at automobile production were halted. In the 1960s, Virgil Exner designed a Bugatti as part of his "Revival Cars" project. A show version of this car was actually built by Ghia using the last Bugatti Type 101 chassis and was shown at the 1965 Turin Motor Show. Financing was not forthcoming, however, and Exner turned his attention to a revival of Stutz. Bugatti continued producing airplane parts and was sold to Hispano-Suiza (another auto maker turned aircraft supplier) in 1963. Snecma took over in 1968, later acquiring Messier. The two were merged to form Messier-Bugatti in 1977. In 1987 Romano Artioli, an Italian entrepreneur, acquired the legendary Bugatti name and established Bugatti Automobili SpA. The new company built a factory designed by the architect Giampaolo Benedini in Campogalliano, Italy, a town near Modena, home to other performance-car manufacturers De Tomaso, Ferrari, Lamborghini and Maserati. By 1989, the plans for the new Bugatti-revival were presented by Paolo Stanzani and Marcello Gandini, famous designers of the Lamborghini Miura and Countach. The first completed car was labeled the Bugatti EB110 GT, advertised as the most technically advanced supercar ever produced. On August 27, 1993, through his holding company, ACBN Holdings S.A. of Luxembourg, Romano Artioli purchased the Lotus car company from General Motors. The acquisition brought together two of the greatest names in automotive racing history and plans were made for listing the company's shares for sale on international stock exchanges. Bugatti also presented in 1993 the prototype of a large sedan called the EB 112. By the time the EB110 came to market the North American and European economies were in recession and operations ceased in September of 1995. 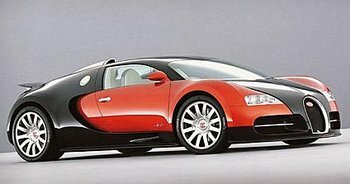 A model specific to the United States market called the "Bugatti America" was in the prepatory stages when the company closed. Volkswagen AG purchased the rights to produce cars under the Bugatti marque in 1998. They commissioned ItalDesign to produce the Bugatti EB 118 concept, a touring sedan which featured a 555 bhp DIN (408 kW) output and the first W-configuration 18-cylinder engine on any passenger vehicle, at the Paris Auto Show. In 1999 the Bugatti EB 218 concept was introduced at the Geneva Auto Show; later that year the Bugatti 18/3 Chiron was introduced at the IAA in Frankfurt. At the Tokyo Motor Show the EB 218 reappeared and the Bugatti EB 18/4 Veyron was presented as the first incarnation of what was to be a production road car. All had eighteen cylinders. In 2000 Volkswagen founded Bugatti Automobiles SAS and introduced the EB 16/4 Veyron concept, a 16 cylinder car producing 1001 bhp DIN (736 kW), at the Paris, Geneva, and Detroit auto shows. Development continued throughout 2001 and the EB 16/4 Veyron was promoted to "advanced concept" status. In July of 2005 Bugatti Automobiles S.A.S. announced that the car, officially called the Bugatti Veyron 16.4, is now in production, and has been tested at a world-record 252 MPH! It is expected that, following the Bugatti Veyron 16.4, Bugatti will produce a four-seat car with front engine, and its own unique chassis, and based on the Veyron engine and drivetrain. Today original Ettore Bugatti cars are amongst the most sought after in the world by collectors, fetching prices as high as US$10 million. The best-known collectors of Bugatti were Hans and Fritz Schlumpf, two brothers who ran a textiles business in Mulhouse, close to the Bugatti factory. Between 1958 and 1975 (when their business failed) they secretly amassed a remarkable collection of the cars. Now known as the Schlumpf Collection, it has been turned into one of the world's great car museums, the Musée Nationale de l'Automobile. In Spanish slang, buga has acquired the meaning of "car", whatever its brand.